My dad is an amazing cook, he is the type of cook that knows what flavors taste well together, and he can come up with some of the most amazing meals without the help of a recipe. My dad is the cook who taught me to love flavors and who taught me to never be scared of experimenting in the kitchen. One of my fondest memories growing up was the "secret" ingredient guessing game that took place during countless family dinners. My dad would place dinner on the table and once my mom, sister and I all took our first bight he would say, "So, can you guess the secret ingredient." The guessing game was always fun as the three of us tried to figure out what the "secret" ingredient was in his stir fry sauce or what different ingredient he used in the marinade for his grilled chicken. The answers usually surprised us but we couldn't complain my dads dinners were always down right delicious! In a way this chicken, specifically the marinade reminds me of something my dad would have come up with. This chicken is flavorful, down right easy to prepare and reminds me a lot of the countless meals I was fortunate enough to enjoy with my family growing up. Gather with family, friends and loved ones, make memories and enjoy! 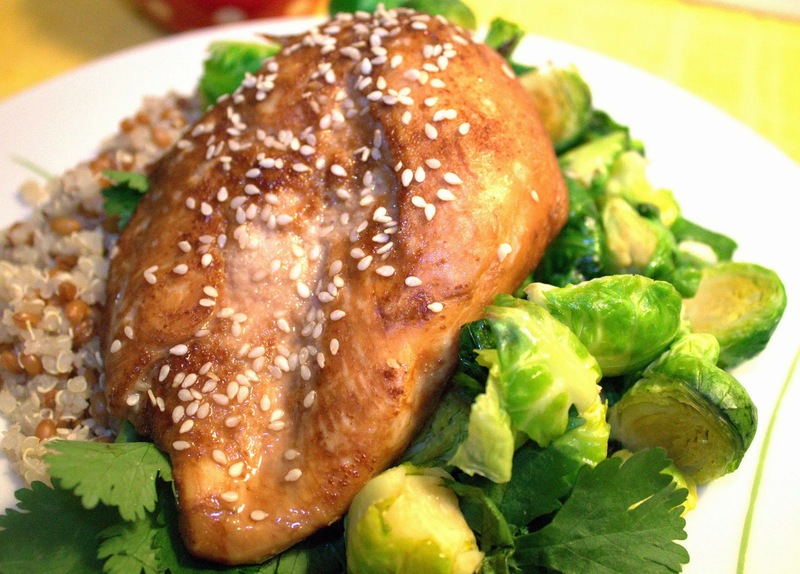 **Note - I served this chicken with roasted brussel sprouts and a wheat berry/quinoa blend. To roast brussel sprouts toss 1 lb brussel sprouts with 1-2 teaspoons olive oil, salt and pepper to taste. Roast for 30 minutes or until brussel sprouts are tender and crispy in a 375 degree oven. 1 - Preheat oven to 375 degrees. Then, Combine marinade ingredients, whisk till combined and set aside. 2- Poke holes in chicken breast and rub both sides of each chicken breast with olive oil. Then sprinkle each chicken breast with a little salt and garlic. 3- Heat 1/2 teaspoon olive oil in skillet and swirl to coat. Add chicken breast to skillet. Cook chicken in pan for 5 minutes, flip chicken and cook another 5 minutes. 4- Whisk marinade together again to ensure it is combined and pour over chicken in skillet. Let chicken cook on stove top for 2 minutes. 5- Place the skillet in the preheated oven and bake the chicken until cooked through. 10-15 minutes. Remove chicken from pan and garnish with sesame seeds and cilantro. Check out these other fabulous chicken recipes from around the web! Grilled Chicken with Honey Chipotle BBQ Sauce - Cooking Light ** The BBQ Sauce is Amazing! !